Today in Detroit, Honda held the world debut of the all-new 2018 Accord, which goes on sale nationwide this fall. 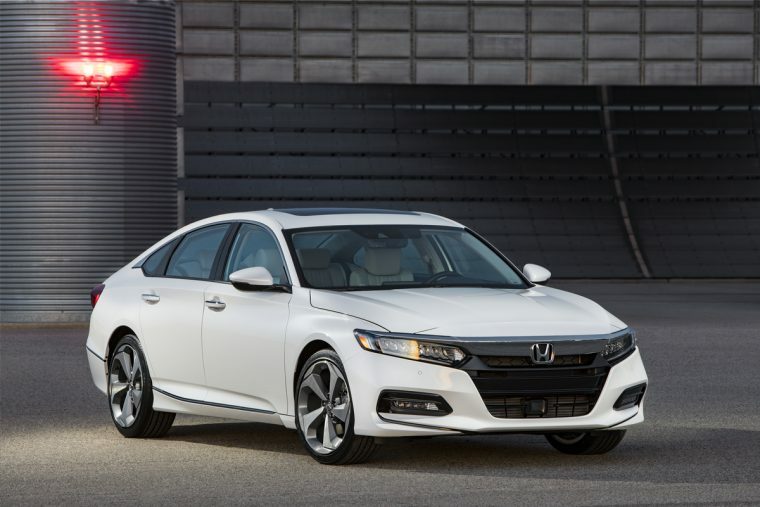 The redesigned model charts a new direction for America’s retail best-selling midsize sedan, which boasts next-generation Honda design, packaging, and proportion. The tenth-generation Accord is all new from the ground up, with a lighter and more rigid body structure, advanced new chassis design, two new turbocharged engines and a new generation of Honda’s two-motor hybrid technology, and the world’s first 10-speed automatic transmission for a front-drive car. 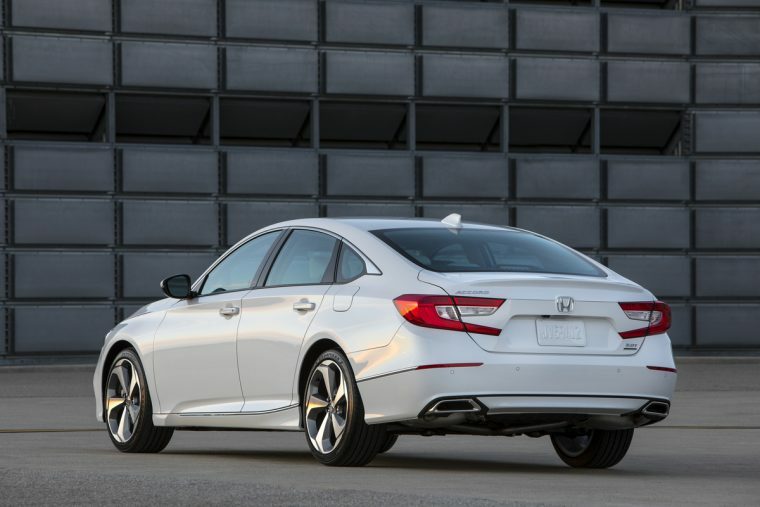 The restyled Accord has a more premium appearance, thanks to a lower and wider body, a sweeping greenhouse positioned farther back on the vehicle, shorter overhangs, a bold front fascia, a long and low hood, and a visual center of gravity moved closer to the rear wheels. 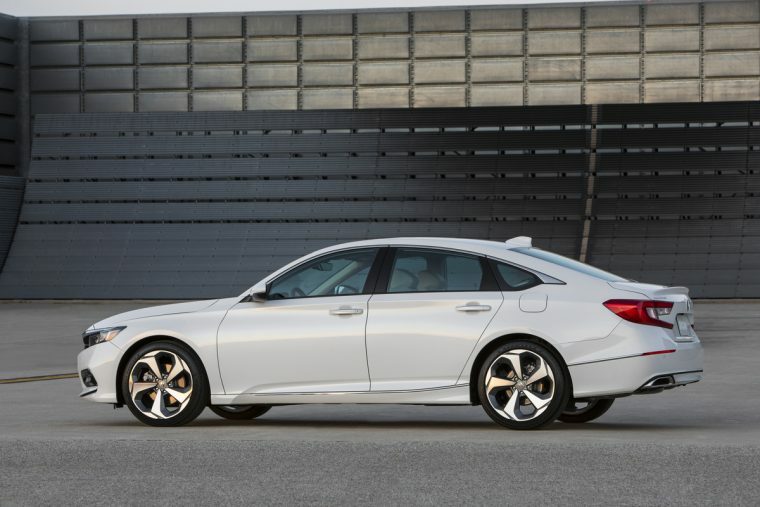 The new Accord body features a longer wheelbase (+2.16 inches), a lower overall height (-0.59 inch), a wider (+0.39 inch) body, wider wheel tracks (+0.20 inches in front, +0.79 inches in rear), a shortened overall length (-0.39 inch) and lower, sportier seating position (-1.0 inch front, -0.79 inch back). Those changes give the Accord almost two extra inches of rear leg room and an overall passenger volume increase of 2.5 cubic feet. The 2018 Accord’s larger interior is also tech savvier than the outgoing model, and features an all-new HMI that includes an ultra-slim 7-inch TFT driver’s meter and a new 8-inch Display Audio touchscreen interface with physical volume and tuning knobs and more intuitive, smartphone-like features and functionality. Perhaps the Accord’s biggest update involves the three entirely new powertrain options—two direct-injected and turbocharged 4-cylinder engines and the third generation of Honda’s two-motor hybrid powertrain technology. The new 1.5-liter, 16-valve DOHC direct-injected turbo with dual Variable Timing Control (dual VTC) yields 192 horsepower and 192 lb-ft of torque and is mated to a continuously variable automatic transmission (CVT) or, with the option of a 6-speed manual on the Sport trim. Its throatier, turbocharged companion, the new Type R-inspired 2.0-liter 16-valve DOHC direct-injected turbo with i-VTEC valvetrain, produces 252 hp and 273 lb-ft of torque, and is paired with the world’s first 10-speed automatic transmission for a front-drive car. The Accord’s new hybrid powertrain features a 2.0-liter Atkinson cycle engine with more than 40% thermal efficiency, which is the highest for any mass-produced Honda engine. That’s paired with electric motors that represent the first drive motors in the world to use magnets containing no heavy rare-earth metals. Honda says that more detailed information will be provided closer to launch, but the automaker has confirmed that the 1.5-liter powered Accord will be available in six trims—LX, Sport, EX, EX-L, EX-L Navi, and Touring—while the 2.0-liter model has four trims available: Sport, EX-L, EX-L Navi and Touring. The new Accord Hybrid will be available in five trims—Hybrid, EX, EX-L, EX-L Navi, and Touring.